In doing research for my recent blog about the impact of the Richard Diebenkorn "Ocean Park" exhibition at The Orange County Museum of Art, I discovered something noteworthy in the public response to the show. During my 3 visits to OCMA I had noticed that the galleries were unusually hushed, and that people were taking their time, lingering in front of the paintings. Slow looking, rather like the intense scrutiny a painter might give his or her own work during the course of its creation, was very much in evidence. Normally, I think that people go to art exhibits to "see" things, but something about Diebenkorn's large abstractions caused some to use seeing as a way to access another kind of experience. More than a few visitors wanted to meditate on the paintings; to use their inspections of the art as a means to turn inward towards both the personal and the spiritual. "The practice of perceptual representation enlists the principles of and is analogous to the practice of 'meditation'. It cultivates an awareness of the intrusions and distractions of the mind that impede perception. It requires a slow, steady and sustained point of focus. It demands our time, patience and trust. It rewards the practitioner with a richer and deeper understanding of and empathy for the world we inhabit." Several people intimately involved with the presentation of the "Ocean Park" show made a connection with meditation. The exhibition's curator, Sarah Bancroft, told me that her regular visits to the show had been a "daily meditation." Author Peter Clothier, who has observed that museum goers spend an average of 6 seconds in front of a painting, came to OCMA to facilitate one of his "One Hour/One Painting" workshops. Clothier gathered small groups to sit in front of individual Diebenkorn paintings for an hour. He then asked his participants to meditate on the works, with their eyes alternating between open and closed. Zen poet Peter Levitt, who contributed an essay to the "Ocean Park" catalog, later facilitated a standing meditation and writing workshop for museum docents. "I gave them ways to see them not with their eyes," says Levitt. Richard Diebenkorn, who was famously down-to-earth, would have likely been puzzled by the idea of people "meditating" on his works, and most art museums are conceived with the idea that shows should present well lit paintings to crowds of visitors who will be chatting with each other, or listening to docent talks and audio tours. Meditation, especially silent meditation, seems to belong in Temples, Ashrams or memorial chapels. 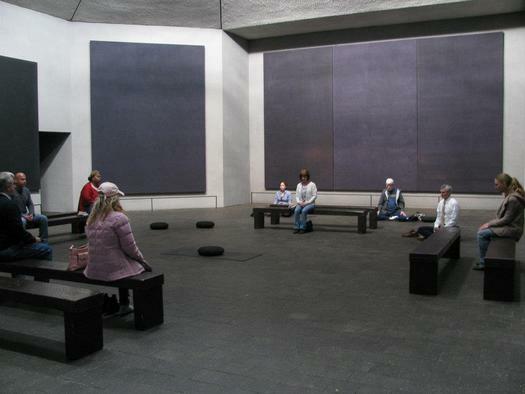 There is, however, one especially fine place in the United States where silent meditation in the presence of great modern paintings is encouraged. It is the Rothko Chapel in Houston. Established in 1971 by John and Dominique de Menil, who were avid collectors of modern art, the chapel houses a suite of fourteen deeply toned purple and maroon abstract murals painted by Mark Rothko in 1967. "The Rothko Chapel is oriented towards the sacred, and yet it imposes no traditional environment. It offers a place where a common orientation could be found -- an orientation towards God, named or unnamed, an orientation towards the highest aspirations of Man and the most intimate calls of the conscience." Emilee Whitehurst says that one of the chapel's intended functions is to bring a sense of reverence into a secular setting using modern art as a touchstone. "The de Menils were very passionate about the need for reverence," Whitehurst notes. "They were Catholic, but they also had broader spiritual convictions. They felt it was a tragedy that the modern and the sacred were diverging, and that the Catholic Church was not recognizing modern art." "These paintings are the colors I see when I close my eyes at night," wrote a visitor named Jessica on December 8, 1988. " I feel grief, a grave sense of loss... then exhilaration and calm." Mark Rothko once told art historian William C. Seitz: "One does not paint for design students or historians, but for human beings, and the reaction in human terms is the only thing that is satisfying for me." Rothko might have been surprised at the range of human interactions that now take place in front of his paintings. The Rothko Chapel is available for ceremonies including weddings, baptisms, bar mitzvahs and memorial services (without caskets). Programs, including concerts, lecture services and symposia regularly use the august Rothko paintings as their backdrop. Among the many regular programs offered by the Rothko is "Twelve Moments of Spirituality and Healing." Held on the first Wednesday of every month, the program provides "guided meditations offering an opportunity for healing and spiritual development." In the presence of Rothko's brooding murals, practitioners of Buddhist, Sikh, Tapping, Muslim, Christian and other meditation traditions will be leading meditations in the coming months. "The Rothko Chapel is here for people every day," states Emilee Whitehurst. "It is such a gift." "The world today needs many more Rothko Chapels," wrote a visitor in chapel's comment book in July, 1994, and the world seems to be getting more. Not far from the Rothko Chapel, James Turrell's new "Twilight Epiphany" at Rice Univesity provides seating for 120 people who can observe changes in the sky in a contemplative fashion. It is one of 25 "skyspaces" that Turrell has created across the world in the past 4 decades. The Board of Trustees of Stanford University recently approved $4.2 million dollars for the construction of the "Windhover Contemplative Center," due to open in 2014, where visitors will "rest in quiet reflection" in the presence of 4 paintings by the late Nathan Oliveira. Unlike Rothko's Houston murals - which are abstract - Oliveira's large canvases are semi-abstract, and feature images of wings and horizons that connect with the vision of a soaring falcon in Gerard Manley Hopkin's poem "The Windhover: To Christ our Lord." Although Oliveira was raised Catholic, his "Windhover" paintings reflect a spirituality that is poetic and responsive. He told Stanford Magazine in 2003, when discussing his series that "... a painting is also a vehicle. I set it up to the degree that it gives you something recognizable to interact with, and if you're creative, you create your own metaphor." Stanford already has a church, the glorious Italianate "Memorial Church" that has survived two major earthquakes, so to some, having a contemplative center might seem redundant. Of course, strictly speaking a church is for prayer, and prayer is directed to God. Modern art, whether seen in a museum or a comtemplative center is meant to direct people inward, not outward. Meditation, and "mindfulness" are for an emerging generation consider themselves "spirtual but not religious." Then again, maybe meditation and prayer are closer than one might expect. Buddhist author Phillip Moffitt equates Christian "prayer" with Buddhist "intention," and Buddhist "mindfulness" with Christian "observance." Whatever the case, it appears that there is a growing trend to see modern art - especially abstract art - as a spiritual gateway. In art museums and galleries, expect to see more slow looking and meditating. When I see it I plan to respectfully stay quiet and let it happen: I may try it myself. After all, for many of us, art galleries and museums are as close to church as we ever get. "With the eclipse of religion in the West," says David Greusel, an architect who specializes in the design of places where people come together, "the art museum has replaced the cathedral as the building type with the greatest architectural, social, and spiritual significance in a community."